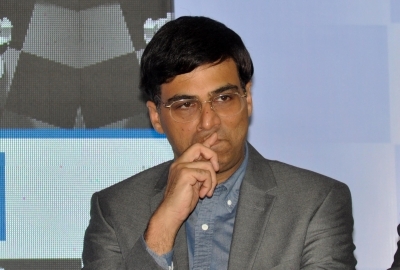 Kolkata Sep 15 (IANS) Back in a mix after a gap of 12 years five-time former world champion Viswanathan Anand on Saturday said he is confident of a good show at the 43rd Chess Olympiad in a week s time adding that he feels his own form remains a bit wobbly these days. Anand 48 underlined his stature as one of the strongest players in the world at the Sinquefield Cup last month where he went undefeated and finished sixth out of 10 participants. Though he didn t manage any wins the world No.10 put scepticism around his age to rest. At the Olympiad -- the sport s biennial equivalent of the Olympics -- Anand will be part of the Indian team for the first time since 2006. "Generally these days my form wobbles a lot more. I have noticed though that most players suffer from the same phenomenon. No one is able to keep a kind of stability going on forever. So I am not particularly concerned. You play when you play well you don t have to give your best everywhere " Anand told reporters on the sidelines of the announcement of the Tata Steel Chess India rapid and blitz tournament here in November. The five-member Indian men s team for the Chess Olympiad will be spearheaded by Anand. The other members are GM P. Harikrishna GM Vidit Santosh Gujrathi GM B.Adhiban and GM K.Sasikiran. The Indian men s contingent won a bronze at the 2014 Olympiad in Norway. In Azerbaijan in 2016 both the men s and women s teams finished fourth agonisingly close to a podium finish. Anand represented India in five Olympiads between 1984 and 1992 then India s only Grandmaster and again in 2004 and 2006 at the peak of his career. Since the 2006 edition in Turin the ace grandmaster distanced himself from the Olympiad owing to several issues including the "zero-tolerance" policy (the policy forces a player to forfeit a game for being late by even a few seconds) and the unpredictability of the Swiss format. "As for the Olympiad there is no specific reason I stopped playing. I didn t like Turin (venue of 2006 Olympiad) for many reasons and right afterwards I was quite exhausted and so I cannot tell you why I joined the team again. It just worked out and the Federation was very cooperative and it happened. "I don t have a specific reason for that but I am looking forward to playing. It s been a decade but we now have a very strong team. I would like to say though that they have made life quite hard because they have already finished excellently in the last two so we have a very high par now. Hopefully we will have a good result this time " Anand said. About India s medal hopes relying heavily on him Anand added: "The Olympiad is an individual event played by teams. I will do my best on my board but I will play better if I see the rest of the team playing well and they will do well if they see me playing well. "It goes back and forth. The same thing goes about own game as you know the problems you face. But if the team atmosphere is good you benefit from that. I am confident our team will have a very good atmosphere generally we get along very well together. Even in the camps we have a very good time. I am confident the atmosphere will be very good." Asked about the much-talked about World Chess Championship between reigning world champion Magnus Carlsen and challenger Fabiano Caruana in November Anand predicted that it won t be so easy for the Norwegian this time. "It s the closest World Championship match by rating. In fact there were moments when it seemed like the No. 1 spot is up for grabs. It still could be in either the Olympiad or the Club Cup. And definitely the fact that Fabiano is able to win so many games means that Carlsen..how should I put it..his confidence in the inevitability of the result is not what it used to be. "Nothing is assured anymore he has to fight. For me neither of them could feel sure of anything. The match could turn any moment and that makes it interesting to follow. Both of them have a style and would want to go at each other that means an open match." On being asked about the possibility of chess being included in the Olympics Anand said: "I certainly hope so. You hardly need to spell out why." "We have our own Olympiad at the moment which I will be going to next week. But ideally we would just be part of the Olympic Games. "The good thing for us is chess could fit into summer or winter months so it should be easy for us to get in. There are a group of mind sports which are trying to get in and I hope it will happen " he added.